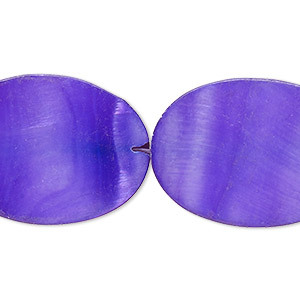 Bead, mother-of-pearl shell (dyed), purple, 7x4mm oval. Sold per 15" to 16" strand. Item Number: H20-6603NB Have a question about this item? Bead, mother-of-pearl shell (natural), 7x4mm oval with 0.3mm hole, Mohs hardness 3-1/2. Sold per 15-1/2" to 16" strand. 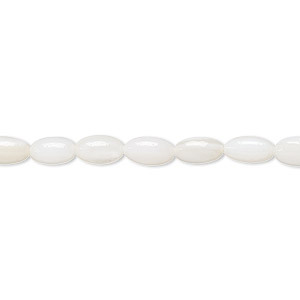 Bead, mother-of-pearl shell (bleached), white, 7x4mm oval, Mohs hardness 3-1/2. Sold per 15-1/2" to 16" strand. 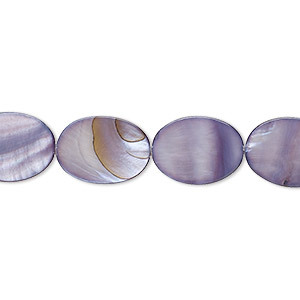 NEW - Bead, mother-of-pearl shell (dyed), dark purple, 14x10mm flat oval with 0.6-0.8mm hole, Mohs hardness 3-1/2. Sold per 15-inch strand. 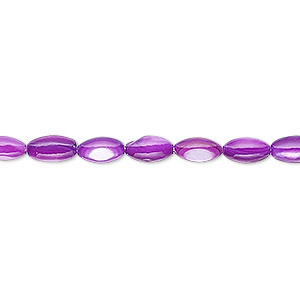 NEW - Bead, mother-of-pearl shell (dyed), dark purple, 18x13mm flat oval with 0.6-0.8mm hole, Mohs hardness 3-1/2. Sold per 15-inch strand. 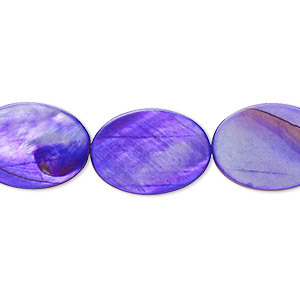 NEW - Bead, mother-of-pearl shell (dyed), dark purple, 20x13mm-22x13mm flat oval with 0.6-1mm hole, Mohs hardness 3-1/2. Sold per 15-inch strand. 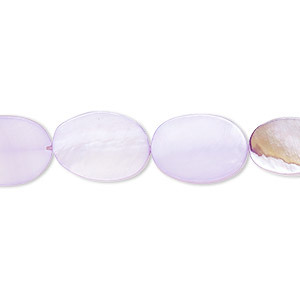 NEW - Bead, mother-of-pearl shell (dyed), grape, 30x21mm-30x22mm flat oval with 0.6-0.8mm hole, Mohs hardness 3-1/2. Sold per 15-inch strand. 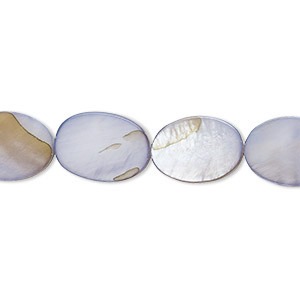 NEW - Bead, mother-of-pearl shell (dyed), grape, 35x25mm-36x25mm flat oval with 0.6-0.8mm hole, Mohs hardness 3-1/2. Sold per 15-inch strand. 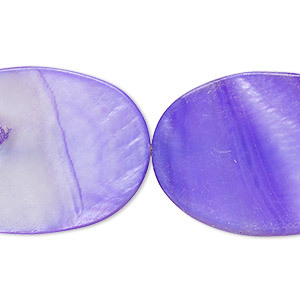 NEW - Bead, mother-of-pearl shell (dyed), lavender, 14x10mm flat oval with 0.6-0.8mm hole, Mohs hardness 3-1/2. Sold per 15-inch strand. 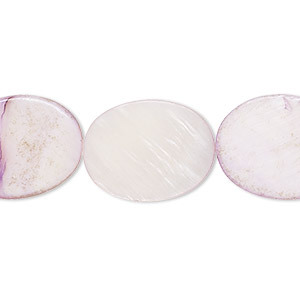 NEW - Bead, mother-of-pearl shell (dyed), light purple, 15x10mm flat oval with 0.6-1mm hole, Mohs hardness 3-1/2. Sold per 15-inch strand. 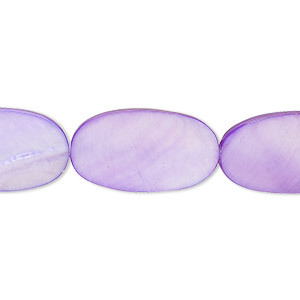 NEW - Bead, mother-of-pearl shell (dyed), light purple, 20x15mm-20x16mm flat oval with 0.6-1mm hole, Mohs hardness 3-1/2. Sold per 15-inch strand.